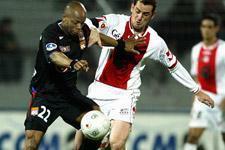 This will be then tenth L1 meeting between Ajaccio and Lyon. If the Corsicans were imprious from 1967-73 with four wins and two draws, they have come under the rule of Les Lyonnais since their return to the top flight in 2002, with two losses and a draw. After a very promising debut to the season with four draws and two wins, Porato and co. slipped steadily into the danger zone. José Pasqualetti replaced Rolland Courbis in the hopt seat in Week 22. Courbis had taken just 13 points in 21 games, his replacement is on eight points from seven games. All in all: four wins, nine draws and 15 defeats; 16 goals scored and 34 conceded. The islanders are coming off two losses in a row (Bordeaux and Lens). At home, the Red and Whites have three wins (OM 3-1, Auxerre 1-0 and Nancy 1-0) ; 5 draws (Lille 3-3, Le Mans 0-0, Strasbourg 0-0, Lens 0-0 and PSG 1-1); five losses (Rennes 1-0, Sochaux 1-0, Troyes 1-0, Nantes 2-0 eand Bordeaux 2-0). Nine goals scored for 12 conceded. When Ajaccio score, they don’t lose! 14 goals scored from within the penalty boxand two from outside; 4 headers; 4 goals from crosses; 3 resulting from free-kicks; 1 from a corner; 2 penalties (OM and OL); 1 own-goal (OL). Lucas and N’Diaye 4 goals, Rocchi 3, Saïfi 2, Diawara and Edson 1, o.g. 1. Note that N’Diaye has scored Ajaccio’s last four goals. 34 goals conceded, 30 of which were inside the penalty area and four outside; 9 headers; 15 from crosses; 2 resulting from free-kicks; 2 from corners; 1 free-kick (OL); 1 penalty (Toulouse). 19 goals have come from the flanks! 5 goals have come in stoppage time and two resulted in defeats (Sochaux and Le Mans 1-0) and one draw (Lille 3-3). Mr Layec will referee the match. 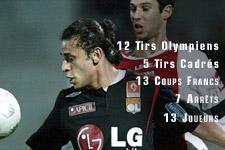 This season he has already refereed Nice 1-0 Ajaccio; OL 1-0 Strasbourg and OL 2-0 PSG. OL beat Ajaccio a few weeks ago at the Stade François-Coty in the last 32 of the Coupe de France: 2-1 after extra time, goals to Cris and Govou.